Desktop software called Stringfellow Interface for Data and Documents (SIDD), that provides desktop access from a WindowsTM PC to all data. SIDD uses a series of wizards to view and graph chemistry data, flow data, instrument readings, weather data, well construction data, and shipment data, performs calculations to estimate mass flow rates at various locations, and can be customized by users to remember their most commonly used locations and chemicals. SIDD was developed using VB.NET. Software to run on a barcode reader to allow personnel to quickly enter in correct data and upload the data to the database at the end of the day. A handheld data collection device is used in the field to collect daily monitoring data. Additionally, Tetra Tech installed barcodes on all instruments and trained personnel in their use. Software to handle uploads of Electronic Data Deliverables (EDDs) of given formats. The software checks for errors in the data, such as improper format or violation of database relationships, and provides detailed error messages. The software makes use of the approval and notification system to upload data into the database and generate emails to appropriate users. 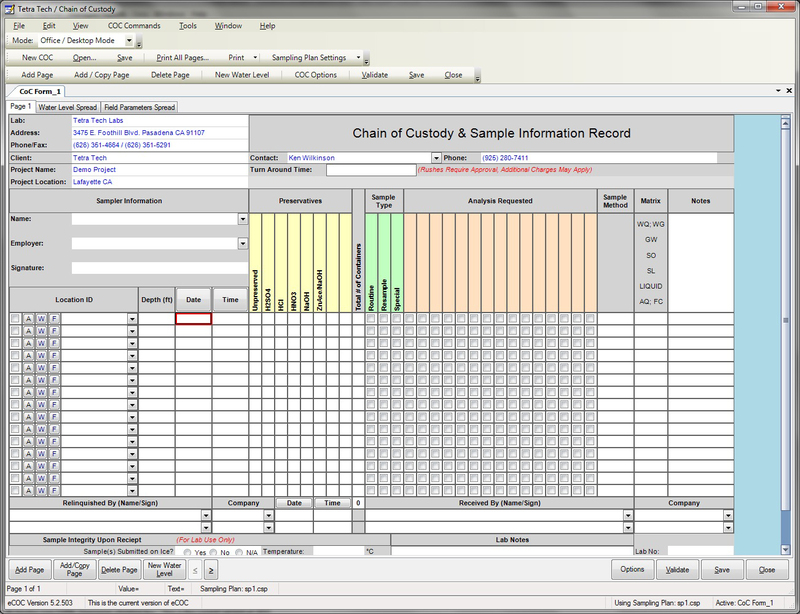 A Chain of Custody software program to enter chain of custody data, which makes the chain of custody document electronic, preventing handwriting translation errors and making it easy to perform completeness checking. This software makes use of drop-down lists to prevent input of invalid data, such as lab methods. The Chain of Custody software was developed using C#. Site-specific software, such as the Alias Generator and ZoneFinder. The Alias Generator encrypts a location identifier into an alias string or performs the reverse process of deciphering an alias string back to its original identifier. The ZoneFinder determines the appropriate zone for a location using its coordinates. Creation of a web mapping system to allow users to access and view a subset of the data contained within the large Stringfellow database. A web-based viewer was created and customized using Apache Flex; the basemap data were created in ArcGIS Desktop, loaded to an ArcGIS Server, and made available as optimized services. Users have a choice of basemap layers to display, including aerial imagery, roads, zone boundaries, and chemical plumes defined in previous years' annual reports. Queries based on ID, type, zone, and waste stream can be run, displayed, and zoomed to on the map, and tabular results (including additional data) can be viewed on-screen or exported to an Excel document; graphical and spatial selections can also be made. In addition, groundwater chemistry and elevation data associated with specific sample locations can be queried.